WW1 Reenactments Equipment : Great War Tommy WW1 Food Rations Labels : Surprise Boer War period Toffee, 1901. WW1 Reproductions and WW1 Reenactors Equipment / Kit - Surprise Boer War period Toffee, 1901. "Surprise" Boer War period Toffee, 1901. 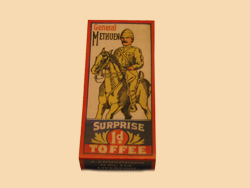 "Surprise" 'turn-of-the-century' toffee wrapper featuring illustration of a mounted General, Lord Methuen in campaign uniform in South Africa.